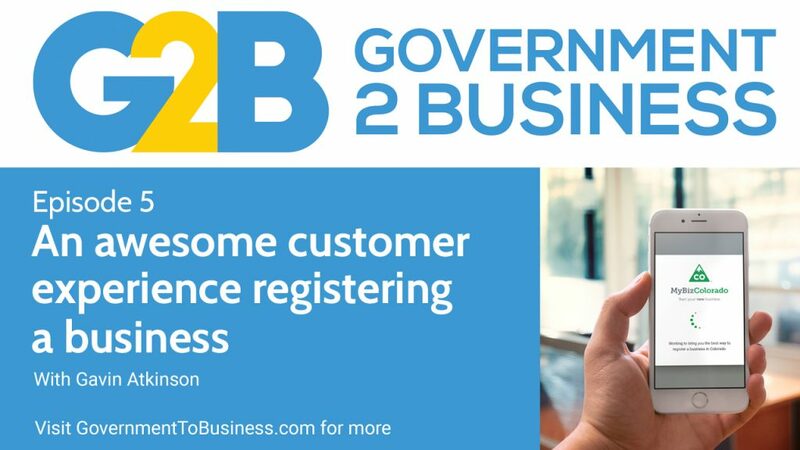 I planned to have an interview this week - which is in the can and ready to go - but I had to share a new really impressive customer experience for registering a business online. 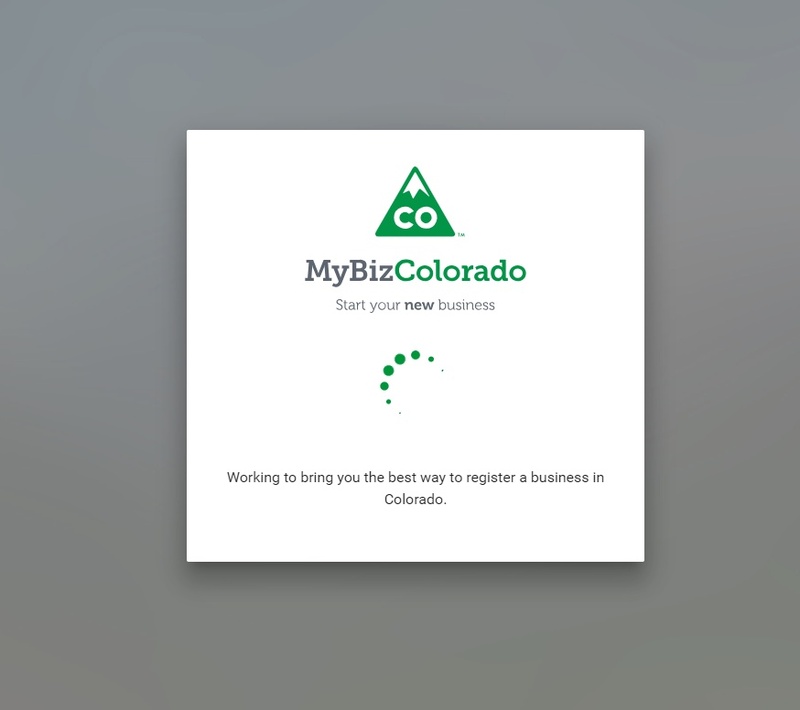 Your government can learn from MyBiz Colorado's intuitive and simple interface and process and apply locally. And of course I look at where the customer journey could be improved even further. How are is the Colorado state government radically improving the customer experience registering a business online? Gavin: G'day folks and welcome to Government to Business. My name's Gavin Atkinson. I planned this week to actually have an interview for you and I've still got that in the can, and I will be bringing it to you next week. But during the week, what really piqued, my interest was a post that came through on my Twitter feed from the Colorado state government in America around their new business portal and I thought, "I've really just got to have a look at this and share some of my thoughts and my experiences with that." Obviously you within the Government to Business community, you currently deliver services to business with your own digital portals. So I thought it's a really good opportunity just to highlight some great stuff, some truly actually great stuff that's occurring with Colorado. And where there's some opportunity for them to improve. That's not only for them to be able to learn from that experience but potentially yourself as well. So the the portal in question I'm talking about is MyBiz Colorado. When it came up in my original Twitter feed I guess what kind of got my interest initially was it was coming through from the Colorado.Gov Twitter account, where they promoted it. Very, very; how would I put it? I won't say, over the top but, you know that their words essentially, was that MyBiz Colorado was the one and only path you need to interact with multiple state agencies to start a business. A little pretty logo with a lovely mountain, with a CO for Colorado there. "MyBiz Colorado: Start your new business." That word "new" being bold. Very contemporary looking actually logo, to be perfectly honest but, what was important here I guess was that call to action. Which really got me thinking. I guess where things change a little bit though was when I started to peel back the layer around to what extent that actually met the expectations that were being set. Subsequent tweets that actually came from the Secretary of State within Colorado, which was Wayne Williams. I think he actually did a much better positioning of the offering, so that it definitely kind of raises your interest and gets you excited potentially as a small business within Colorado around what they're offering is. That doesn't actually, doesn't kind of raise expectations too high, which I'll get to now. So when I'm talking around these expectations I guess my initial thoughts were, "Fantastic!" At last after seeing many, many - or a number of - actual local governments and local councils within or municipal governments within the United States who have really nailed that whole concept of a one-stop shop for business, bringing together not only the transactional component and the licensing and the regulations but also, what do you need to know when you're starting a small business? What are the actual skills you need to learn when you're exploring a new business? What are the managerial skills you need to run an effective and efficient business? So when I went to MyBiz Colorado - which is MyBiz.Colorado.gov - I expected to initially see that holistic experience. And I was a little bit disappointed to be perfectly honest when I kind of had it load it was loading it looked very aesthetically pleasing and in fact when it kind of loads it looks very much almost like you're on an iPhone or Android device where you're getting an actual app experience so it's obviously been designed very much for a responsive website so it doesn't matter what the platform is that a customer is using. But what you actually get instead of that bigger picture is actually a really excellent tailored experience which is extremely intuitive and very very mindful of the customer journey in the experience when they're looking at actually registering their business. So MyBiz Colorado at the moment really I think captures the essence of what makes an truly excellent transactional registration business portal, particularly within a state government. Which is a little bit more challenging I guess then at the council level because you've, within America as an example you've got different levels of responsibility with doing the the federal national government, the state government and local municipal councils and the way the US Constitution works, a lot of the actual responsibilities for business ownership, business registration and employing people and meeting certain government licensing regulations and very much resides within the state government. To actually see a state government in the US do this and to do this well is, um, you know, very, very exciting and very encouraging to be perfectly frank. When you go into this particular site and it starts loading up, what really captured my imagination was the, I suppose the easy way it stepped you through the process if you're wearing the hat of a customer, walking in their shoes. Which is probably a bit of a mixed metaphor there. Wearing hats and walking in their shoes. But we tend to do that. Let's say if kind of imagine that you're a customer, a business user, you're looking at starting a business within Colorado and instantly what you get as I said before, it looks very aesthetically pleasing and it just starts asking you some very, very basic questions. Asking first upfront, you know, have you actually registered your trading name yet for your business? And it doesn't matter whether you say yes or no, it then progresses to the next question asking you around about, look do you plan to hire staff or employees either straightaway or within the next 90 days? Simple yes/no answer again. And then finally, asking the question around and this is obviously again a local aspect of American government, do you plan to sell goods, basically goods or rent goods, or are you planning to sell non-taxable services? So obviously within Colorado, the actual sale of goods or the renting of goods has a state sales tax but the actual provision of a service in a number of cases is a non-taxable service. So I thought, okay, this is good. The one thing I'd probably say that I would have liked around now or maybe a little bit earlier was a bit of an idea around, how long this process would take? I do - and I have been known occasionally to throw a little bit of mud towards the UK government with their provision of service delivery, particularly for business - but one thing they do do very, very well is in fact actually be quite upfront with the customer around how long a process will take, and I think that's actually really encouraging. We know business is a very, very short of time but the one thing that I think Colorado does excellent here is the way that they provide the opportunity very subtly, but you know quite obviously, which is a mixed metaphor again, this is going to be a mixed metaphor episode, where they make it quite clear that look, you can continue going with what, when you're asking questions or you can save and come back. I love their turn of phrase, it's not very government-y. And I mean that in the sense that it doesn't seem to be, it's official enough that you know, hey I'm definitely within government but it's a little bit more casual. And you know to the extent that if you don't want to ask any more questions because you need to go off and do something else, maybe a customer's walked into the shop or more than likely if you're actually a business owner and you're doing all this work at night after you've been in your business all day, you know maybe the dogs gone barking or the kids have gone and want something, I don't know, there's a little button down there saying, "I need a break! ", complete with an exclamation mark at the end. There's that ability very much to save what you're doing and come back to it at a later time. I actually did this quite inadvertently. I was going through this process as a customer, walking in their shoes and actually left the browser tab entirely. I just closed it. I didn't even save it, saying I need a break or anything like that. Came back to it probably half an hour or so later and it actually remembered exactly what I had been doing. Now, it's not remembering it obviously, it's using for that type of thing based around presumably a cookie based scenario. But for it to take that approach I think is something that governments tend to shy away from. Governments tend to overthink. We tend to over engineer solutions when it comes to managing the customer experience from an account perspective. And this, you know, this approach of just a simple, you know, cookie it's so obvious but it's, it makes so much sense. So to the extent that I went back in and it was quite clearly saying, "Oh great, welcome back and are you ready to take your next steps?" And to that end that provision of initially starting with a cookie potentially to, you know that's the only way they could do it, to remember your progress to date. It very subtly, but very persuasively provides you with that opportunity to take it to the next level and not in a difficult way. There's an example there on the left-hand side where basically it says, "Hey just create an account with us," this way you can actually manage your experience with Colorado state government when it comes to your business. Or alternatively they provide again presumably, through Oauth2 the ability just to login and recognize yourself from an account perspective using one of your many existing social media credentials that already exists. So that could be Facebook, that could be Twitter, it could even be Google with your Google Gmail account. That's a really positive step I think in being able to manage things. You don't need to worry at this stage when you're just starting a business to worry about issues of delegated authority and how you're going to manage that. It's just a simple process to be able to create a business within a state government. So to that end that was really, really encouraging, again, the language that was used after I went through that, a simple question of you know, "What can we call you?" So nothing like the usual format within government, which says you know, provide your given name, provide your family name, provide you know, your salutation whether a Mr, Miss, Ms, Mrs and so forth. It was just like, what can we call you? And just providing that basic information was again very intuitive, very easy and a very warm experience if I could put it that way from a customer perspective. At that stage it then prompted me and said look, hey great here's where we're currently at. Here's where you are so far and it provided, you know, a simple little process: one, two, three, four, five. Highlighting number one saying this is where you're currently at. You've got your introduction and profile and again the words, "Not quite done yet." Very intuitive, very simple, very easygoing. Maybe this is the way things work in the mountains in Colorado as opposed to the hustle and bustle of you know, within the east coast or west coast within America. Maybe because they're on mountain time. Other questions, you know, which you haven't got to yet, you know, "Tell us about your business, tell us about the people involved in your business, tell us about your company activities." The last step is probably the only step that I found a little bit jarring and again, they've been so clever and so smart I guess with the ease of language used and step number five is "Attestation". Basically the process to prove who you are. I think they could have chosen a much better set of words around that. Still to kind of get the message across. And look at this stage I thought look, I don't want to ruin their statistics and kind of actually go down, the path of accidentally creating a business within Colorado - as interesting an experience I'm sure it would be. But I thought, look I better go back out and just see what's going on at this stage because from my perspective this was, apart from that very last piece with that "attestation" it was a very good experience. I said before that there could potentially be an option, upfront to kind of say how long this process would take. I actually, would take that back now. And say I think the process that they've followed is actually a better way, maybe at this screen where you're saying, hey you know, you're not quite there yet, at that stage you could, say maybe this step one usually takes five to ten minutes, step two usually takes 20 to 30 minutes and so forth. What happens to be the case, so that the customer can kind of work out, "Okay, I've got that half an hour, tonight I'll better do that. I'll be able to save that and I'll come back to that tomorrow." I think that would be a far more logical way of being able to present the information. But overall for an initial offering it's a very, very good offering and I do want to, you know, provide credit where credit is due when it comes to the way, that Colorado has delivered this. I mentioned before that the other things that they could have done a little bit better I guess was how they position this offering more broadly across Colorado to businesses. When I say that, this obviously came up in my Twitter feeds. 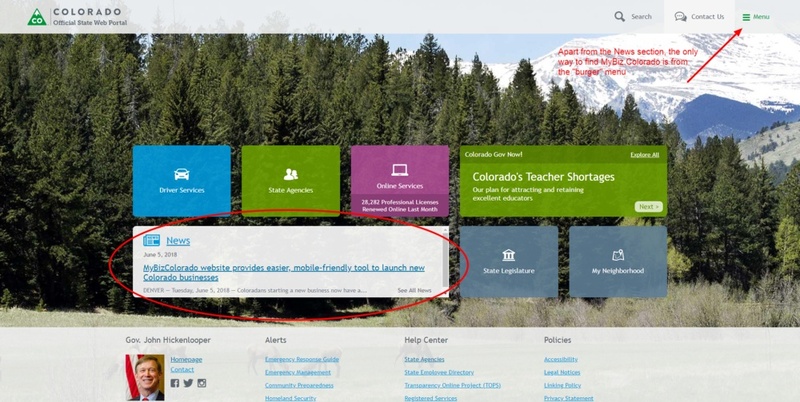 I did go to the Colorado.gov state government portal. It was actually surprising to find smack bang in the middle of the homepage there they've got a newsfeed feature which actually highlights the MyBiz Colorado website and making it easy for you to be able to start your new business within Colorado. So that's fantastic what they've done there, but then I when I had a look around, apart from that, there was no real call to action and the reason I say that is, that's a news item which right now as of the time of recording is entirely, makes perfect sense, it's going to be up there at the very, very top. Because this only happened a few days ago. The question is what happens a week from now, a month from now, six months from now, when other news has taken over the way state government is run within Colorado and that's been pushed way, way, way, way down that page. Or is just pretty much not found at all. Like you know, results on page two of Google. Never seen. The way that things are actually, are logically organized within the information architecture for that Colorado.gov site, there is like within the little burger, menu you know, those three lines at the top right hand of the page saying "Menu", there's a drop down area there which does have a section for Business and then if you go into Business and Employers it can provide you with information at that point of time. But it's not really intuitive. It's not quite as customer-centric as I'd generally would recommend government to follow. There is definitely opportunities at that level to be able to better promote the experience as far as businesses are concerned. When you get through to that Business and Employers page the very number one you know, it's organized within chunks such as Starting a Business, Incentives and Tax Credits, Recruiting, Labor Laws and so forth. And then within each of those sections there's you know, about five to seven different options, so well laid out, very well logically ordered and the very first option there is Register my Business, which actually takes you straight through again to that MyBiz Colorado site. The very interesting bit I found when I was doing this experience and just you know, again trying to see what happened, would it take me back to the start? No, it actually took me to a dashboard that had then been created, you know, where I provided my name to you know, as I said before, what should we call you? And very logically and very linearly it actually outlined, here's the current process where you're at within your filing. It was quite brief but without being too brief. It was again a really, pleasant experience and something I am just so surprised to see a state government within the US do and to do very, very well. So again my hat goes off to them on that. When I have gone through that experience though, I did actually notice on that page for Colorado.gov, within that business page they had a little thing, actually it was quite a big feature on the side about you know, "Learn more about starting a business." And I thought that's interesting, I'm keen to see where that goes. Does that kind of create that linkage back through to MyBiz Colorado, and it does in a way. It actually takes you through to a page about starting a business that has been put together by the Department of Labor and Employment within Colorado. Very prominent Heading 1: "Starting a business" the first first sentence and paragraph actually kind of sets a bit of an expectation. I thought, "Oh, this is going to be good." You know we can help you access the tools you need to start your business. Use this checklist to make sure you're complying with laws and regulation the Department administers. And at that point it then goes into a whole heap of I suppose again, it just it does actually say what the second sentence says. It's about the laws and regulations that that department administers. It moves away from that customer-centric model of bringing together five or six different service offerings across state government and goes back into that silo mentality of here's what this department offers you. Rather than actually going, "Okay as a small business owner, someone who's looking at starting a business here's what you need to know. And here's when you need to do it." So the first thing bang-up front is like you know, register your business for an unemployment account. Which I thought, again I'm obviously an Australian, I'm not used to actually what happens when it comes to the the intricacies of managing and running a business within say the state of Colorado, but it just seemed a very, odd experience to kind of get that up front. That said it it did actually have a link describing about when you're registering for an unemployment account the best way of doing so is to go to MyBiz Colorado so that was good but, again, not the best experience. Likewise having a bit of a look around there are actually a number of other offerings that Colarado provides to businesses and these really weren't very, well joined up so, actually coming strangely out of the Colorado Secretary of State and so the same area that delivers the MyBiz Colorado is the Colorado Office of Economic Development and International Trade. Now maybe they tend to look, after the big end of town I'm guessing, you know to actually attract large scale businesses into Colorado. And maybe from that point of view the customer proposition is a little bit different between what they're offering is and what the actual offering of MyBiz Colorado is which might be more at that small business that's starting up. That said I did kind of expect that even if you were operating a large or medium sized business and you were looking at opportunities to relocate your business to Colorado due to its you know, many different lifestyle positive aspects that there would least be something here that provided you with some clarity around "Okay, you manage your business, or you actually have a business within this particular location: here's what you need to know when it comes to registering a business within Colorado." Now, they may have actually decided to very much aim at a non digital way of being able to engage with those customers so that you build quite up-front a relationship from a person to a person rather than, by the website which is obviously what you tend to do if you're trying to you know service a larger mass audience. But it wasn't as a congruent as an experience as I would generally expect an actual area within the same department that delivers the same service so it's again, it's like a silo within a silo. Not a good experience from that point of view the other thing of course is that within America there's a lot of that actual, that information I mentioned at the very, very at the beginning of this episode around look, what do I need to know about, you know, the skills of starting a business? Is a business actually right for me? Is my idea going to work? All those more exploratory aspects of potentially starting a business. Generally speaking in America, it tends to be delivered by Small Business Development Centers, which are run out of usually each state. They usually tend to be a partnership between the state government and the Small Business Administration, from the US federal government. So maybe due to the way the funding arrangements work between the state and federal government they have to produce it and deliver it in this way rather than actually wrapping it all up and packaging it into a single customer experience as I was saying before and the way that a number of governments worldwide do. But the lack of integration again between this particular site and MyBiz was actually quite alarming. And I guess the other thing about this particular site was, you know, you kind of start drilling down into the Small Business Development Center network for Colorado and they've actually got to be perfectly frank, a fantastic resource with their Colorado business resource book. It's a very, very large book And when I say that it's like a 72 page PDF document complete with hipster beard photos and so you kind of think well this has been recently put together and looks quite you know, on point, very trendy. But the actual level of detail in it was again, it was good, it was really, really good. It took you down to that next level where you know, you need certain information and it did package it up very, very well, albeit within a big PDF document. There's actually quite a lot of opportunity I believe for Colorado if they were working with the Small Business Development Center to look at how can that information be repackaged, how could you actually bring that together into MyGov.Colorado so that there is a, you know, an integrated offering between that "Should I be starting a business" and "Yes, I found all that information out now, yes I do want to start a business and I know my, idea, my market is going to be a good fit. Let's start that business. Let's get into that transactional environment. Let's register." So I think there is actually quite a lot of opportunity in that particular space. The other thing of course was which was a little bit alarming was within that Small Business Development Center they tended to link off to some information again to the Secretary of State to be able to, you know, start your business. 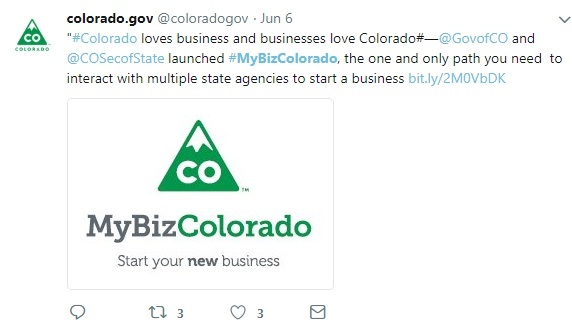 And again this is the same Secretary of State organization which delivers MyBiz Colorado, it also delivers that other website that I mentioned before, Choose Colorado, and it's all around filing a form. So even though there's this excellent resource produced by the same department around registering your business and a fantastic customer experience it still actually still has a page there around here's all the forms that you need to be able to fill in and you can kind of click on those forms and then it'll go off and give you all that information in a very dull, dreary format. So there's something I guess to be mindful of, that there's a lot of opportunity there for that to be improved but overall again, this is very early days. This is only literally gone live within the last few days and as a result it could just be a case that the communication internally within government hasn't occurred yet. It is something that we know, and I'm sure you've experienced this all the time. Communication even within government departments between, you know, offices and different teams isn't always perfect. And there is always an opportunity to improve. So perhaps it's just the case that this hasn't progressed yet through to those areas that I mentioned before to create those linking opportunities. And those opportunities do need to happen, not only from the customer experience but also in just better enabling the way that Google finds MyBiz Colorado. When I was searching and I kind of used a VPN to go in and actually mask my IP address to come out of that mountain area, mountain region of the US, and I was searching for starting a business in Colorado, you know, again nothing within that top page, the top ten results had any links through to MyBiz Colorado so that's a bit of a worry. Again that's something that can be solved obviously by closing down some of those previous pages that are on the Secretary of State's website around filing a number of these forms and then 301 redirecting that so you kind of pass all that link juice, the Google link juice through, improving the linking that's occurring from that actual homepage. Improving the linking that's occurring within a number of those departments that are actually delivering services to business. And of course as well from say the Small Business Development Center as well. Overall, opportunity to improve, without a shadow of a doubt. But if you are looking at how can you deliver a truly excellent experience for registering a business and doing so in such a way that cuts across multiple departments within the same state government, you really you can't go wrong from the offering from MyBiz Colorado. I do really encourage you to have a look at that, to go through and then take part in that experience. As I said before I didn't go all the way to the end so I'm kind of hopeful that it kind of continues that experience but I don't want to kind of, you know, ruin their stats or anything like that. But enjoy, have a look at that and hopefully you'll get some learnings from it and you'll be aiming at how you can in fact deliver that integrated experience, that excellent customer experience when it comes to registering and starting a business within your jurisdiction. 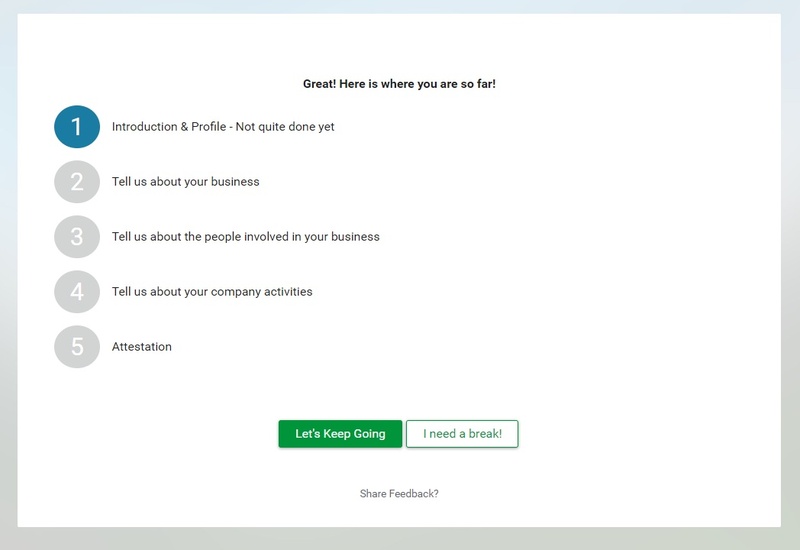 0 Comments on "Podcast episode 5: An awesome customer experience registering a business"